Follow-Ups/Recalls (hereafter referred to as Recalls) are very useful for ensuring your repeat business does not slip through the cracks. However, it can be difficult to fully set up to get the most out of them. 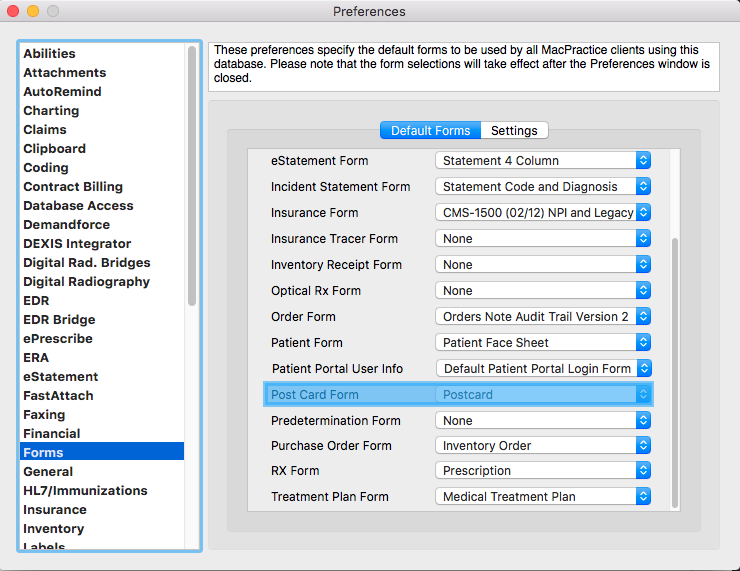 This article will delve into how to set up MacPractice to do the heavy lifting for you, and how to adjust your workflow to ensure Recalls work for you. If you prefer a video format, please refer to Recalls/Follow-Ups Video Guide 1 - Set Up for the beginning of a video series of how to use Recalls/Follow-Ups. Follow-Ups are the same as Recalls, it is simply named Follow-Ups in MacPractice MD and DC, and named Recalls in DDS. These instructions will apply regardless of which MacPractice your office utilizes. First, we will need to set up the Follow-Up/Recall Types your office will need. Navigate to References > Follow-Ups if you are using MacPractice DC, MD, or 20/20. Navigate to References > Recalls if you are using MacPractice DDS. To add a new Recall Type, simply click the Green Plus at the top of the Sidebar. This will add a new Recall. You can name the Recall what you like, and you can set the Frequency in Days. For example, if you want to create a Six Month Recall, you would set a Frequency of Days of 180-186 days (30 or 31 * 6). You can add as many Recall Types as you like, and we strongly recommend you add as many as you need to cover all of your variations of how you typically handle Recall Types. If you need to remove a Recall Type, simply select the Recall Type and click the Red Minus in the Sidebar. Next, we will want to decide whether we want to tie these freshly created Recall Types to Procedures within your Fee Schedule. This will have the impact of adding the tied Recall Type to a patient every time a tied procedure is posted to that patient's ledger. If you consistently use the same Recall Type for each patient with a particular procedure, you will want to tie it. If not, you will want to skip this step and move on. Navigate to References > Fee Schedules, selected the desired Fee Schedule, and then you can search for the Procedure you wish to tie to a Recall Type. The Follow-Up/Recall Type drop down is right below the Short Description field. Select the Recall Type you wish to tie, and then save the record by pressing Command-S. Alternatively, you can save the record by using the Edit Menu > Save Record. Repeat these steps for any other procedures that you wish to tie. There are two ways you can add a recall to a patient. When posting a new charge in a patient's ledger, there is a drop down for Recall Type. If you have a procedure selected that you have previously tied to a Recall Type in References > Fee Schedule, the Recall Type drop down will automatically default to that selected Recall Type. Otherwise, you can simply select the desired Recall Type here. When you save the Charge, the Recall will be added to the Patient. You can verify this by navigating to the Patient Ability > Patient Tab > Follow-Ups or Recalls. By clicking the Schedule button, this will automatically create an appointment on the schedule for this patient on the indicated day. If you do not wish to schedule Follow-Up/Recall appointments immediately, we recommend you turn off the Schedule a Follow-Up Appointment After Charge" preference. Alternatively, if you wish to take a hands-on approach to adding a Recall or Follow-Up to a Patient record, you can simply navigate to the Patients Ability > Patients Tab > Recalls or Follow-Ups and add it from there by clicking on the Green Plus highlighted in the screenshot below. From here, you can also edit the Recall added to this Patient. The Recall Date is calculated by taking the Last Visit Date (which defaults to the date the Recall was created), and adding the Frequency (in days) to the Last Visit. If there is an Appointment tied to this Recall, the Recall would be highlighted in Green. If the tied appointment is prior to the Recall Date, the Recall will be highlighted in Red. This is important to watch for, in case you are using Recalls to take into account the patient's insurance and whether their insurance only allows procedures a certain number of times a year. You can also configure an EMR/EDR Form Section to add a Recall via a Pop-Up Button. To do so, navigate to the EMR/EDR Ability and either create a new Form Section, or open a pre-existing form section. From there, add in a pop-up field from the Form Elements section in the Form Section Palette by dragging and dropping it into your Form Section. Select the pop-up menu you just dragged into the Form Section. In the Form Section Palette underneath the Popup Button Inspector, click the Options Tab. In the Reference pop-up menu, select "Recalls". This will display a list of your Recall Types. Make sure to check "Apply to Patient". This will ensure any template with this form section will add any selected Recall Type to the Patient's record. For more questions regarding building EMR/EDR Templates, please refer to our How To Build EMR/EDR Templates article. You can easily tie any appointment to a Follow-Up/Recall by right clicking the appointment in question and select Set Recall. (Note: In Build 9.6+, this has been renamed to "Tie Recall".) This menu will list every Recall available on the Patient's account. If you are scheduling an appointment, you can have it tie to a Recall by selecting the Recall in the Sidebar, and then create the appointment. The created appointment will be tied to that Recall. Once you have a Recall added to a Patient's chart, you can then track those Recalls via the Recalls Report. You can find this report in the Reports Ability, under the Marketing category. This report can be filtered by Provider, Office, or Recall Type. This Report can be used a few ways. We will describe the typical way this Report can be run to identify Recalls that have no appointments associated with them, indicating accounts that could be followed up on to retain repeat business. The settings in the above screenshot indicate how to run this report to capture Patients that have a Recall on their account, but do not have an appointment tied to that Recall. We do this by following these steps. Set the Report date filter (indicated by the drop down menu below the Provider Filter) to Recall Date. Set the Recall Appointment to include Patients Without a Recall Appointment. Set Recall to "With", indicating that the results will include Patients with a Recall on their Account. Finally, we will set the Start Date and End Date to include the period we wish to search. For example, if I want to find all of my Patients that have a Recall Date in April of 2017, I will set the Start and End Dates to 04/01/2017 and 04/30/2017. The results that generate in this report will include patients that have a Recall in their account, but no appointment tied to that Recall. Therefore, if you tie an appointment to an existing Recall, this report will not pull up that account, as they already have an appointment on your schedule that you can track and follow. You can also print off Recall Reminder Postcards, as described in the next section. From the Recalls Report, there is a button at the bottom labeled "Print Postcard(s)". This button, when clicked, will take the patients listed in the Report generated, and allow you to generate Recall Reminder Postcards. For more information, please refer to Marketing Report - Follow-Up & Recall.